While on our road trip we were reminded of the fire danger in the Western United States. So Annie had an idea that we should help in some way. So she decided that we should be fire dogs to to help raise awareness for what Smokey the Bear says "Only YOU can prevent wildfires.". I thought Annie had a brilliant idea. So now, we are self appointed Fire Dogs. Rosy, I think Annie had a terrific idea! You guys raise awareness for anipals and their people! The wild fires have been horrible this year. Did you encounter any danger on your trip? I love your outfits, adorable! Thanks! We weren't in any danger, but there were Smokey the Bear signs everywhere warning people to be careful! BearHUGs & RosyPoodleKisses! Thanks June. 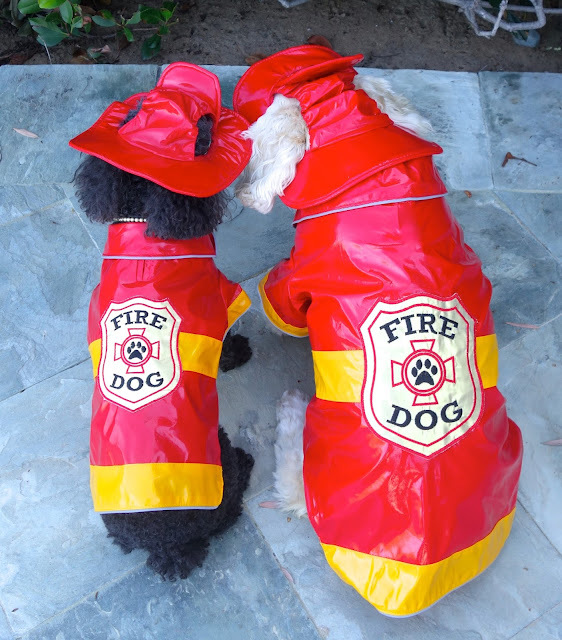 Yes, Annie is so excited to be a Fire Dog. I was really hoping I would find a pink fire coat and hat, but I guess its ok to step out of my pink comfort zone. BearHUGs & RosyPoodleKisses! Oh you both are soooo cute! We know we are all safe with you on the job protecting us. Sorry I don't visit very often - M's back has been extremely bad and she can't sit very long. Thanks Mario! So sorry to hear about your M! Paws crossed that she gets to feeling better real soon. BearHUGs & RosyPoodleKisses for you and M!